What is Killing the Oaks? 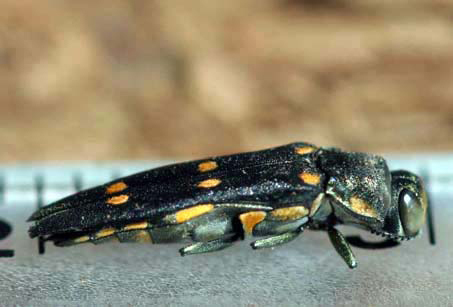 The goldspotted oak borer (GSOB) was first detected in 2004 in San Diego Co., California by the California Department of Food and Agriculture during a survey for exotic woodborers. In 2008, it was found attacking coast live oak, Quercus agrifolia, canyon live oak, Q. chrysolepis, and California black oak, Q. kelloggii, on the Cleveland National Forest and Cuyamaca Rancho State Park. GSOB is playing a major role in on-going oak mortality. GSOB larvae feed under the bark primarily at the interface of the sapwood and phloem on the main stem and larger branches. Larvae kill patches and strips of phloem and cambium, resulting in limb and branch die back and, eventually, tree death. Because of host distribution, GSOB has the potential to spread further north in California and cause similar tree mortality.